Metro-North regular service returned to normal on Wednesday morning, five days after the train crash and derailment involving Metro-North Railroad trains near Bridgeport on Friday, May 17. Patrick Coughlin, of West Haven, was one of the commuters traveling by train on Wednesday morning. "I drove to work Friday. Monday, I was about an hour and a half late, so it wasn't too bad," he said. A track inspection car did a run-through just before 3 p.m. on Tuesday. "With one of the two damaged tracks rebuilt and returned to service, beginning with the 3:07 p.m. departure from Grand Central Terminal, Metro-North will operate about half of the regular eastbound PM peak service and regular hourly westbound service with the 4:23 PM train from New Haven," Metro-North said in a statement issued on Tuesday. Amtrak has also resumed service between New York and New Haven today. Work has been going on around the clock since Saturday night, when the National Transportation Safety Board completed its initial investigation of the scene and allowed Metro-North to begin removing the two 8-car trains, according to the MTA. 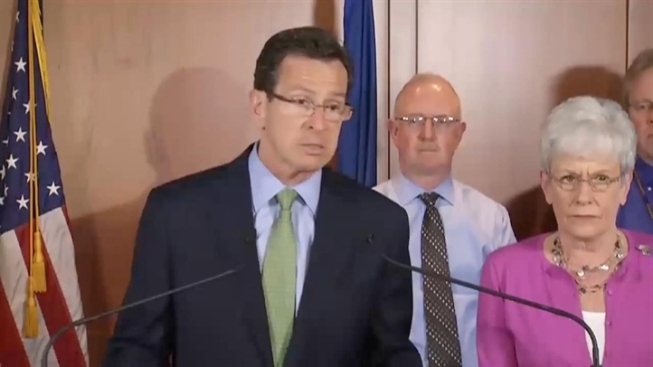 Malloy conceded that traffic on Connecticut's highways was not as congested as had been predicted, but urged people to carpool or work from home on Tuesday to avoid major problems. "We are confident that the reconstruction work, inspection and testing will be completed in time for a normal rush hour on Wednesday," said Howard Permut, president of Metro-North. "We are grateful for the tireless work of all departments and employees engaged in this huge task." About 100 workers have been on the job around the clock since Saturday removing the damaged trains and repairing the track, Permut said. Crews are rebuilding about 2,000 feet of track, according to Permut. The National Transportation Safety Board authorized the removal of rail cars from the crash site on Saturday night, allowing the investigation and clean-up process to proceed. All rail cars were removed by Sunday afternoon and taken to the Bridgeport railyard, according to the NTSB. Investigators are looking into a broken part of the rail that underwent repairs last month, but have not determined whether it was a pre-existing fracture or if it occurred as a result of the accident, according to NTSB spokesperson Earl Weener, who spoke at a news conference on Saturday afternoon. The board said the FBI has ruled out foul play in the investigation. The trains were traveling at approximately 70 mph at the time of the crash, which is the posted speed limit, according to the NTSB. Malloy and other officials spoke at a news conference on Saturday morning where they described a grisly scene after a Metro-North commuter train heading east from New York City derailed and was hit by an oncoming train heading west from New Haven. "The damage is absolutely staggering," Sen. Blumenthal said. "Ribbons on the sides of cars are torn away like ribbons of clothes." The NTSB's investigation could take seven to 10 days but that does not mean that service shutdown will take that long, board spokesman Earl Weener said.. The eastbound Metro-North train derailed just after 6 p.m. and was hit between the Bridgeport and Fairfield stations, officials said. According to Metro-North, around 750 people rode the shuttle trains and boarded buses at Bridgeport to Stamford, which is 20 percent of the 4,000 people who ordinarily board trains at New Haven, Milford and Stratford during the morning peak. However, overall morning peak ridership on the entire New Haven Line was down just 20 percent, indicating that many people drove to other stations to catch a train. Metro-North has set up a toll-free number for customers on the trains involved in Friday’s crash to provide assistance. Call at 1-800-638-7646 for information on referral/support services, lost & found items and assistance with any paperwork. The New Haven Line Service plan is posted on the MTA Web site.